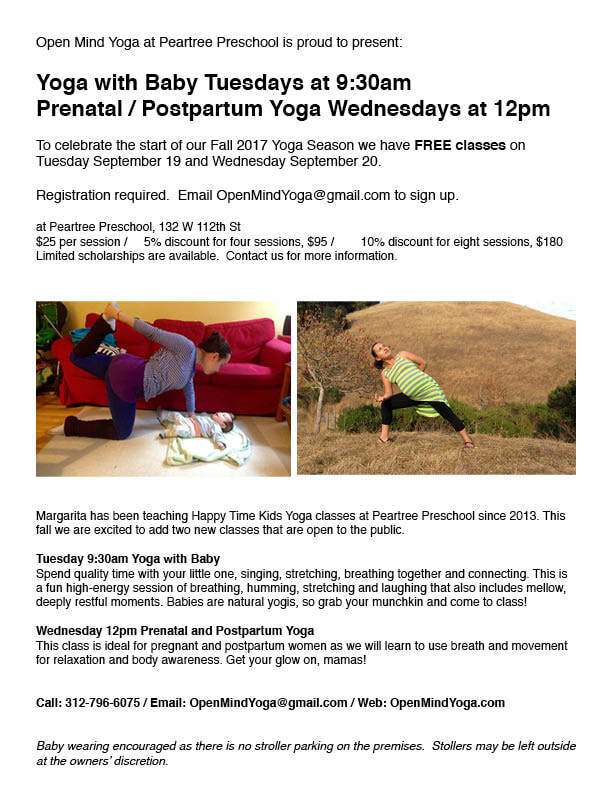 This class is ideal for pregnant and postpartum practitioners as we will learn to use breath and movement for relaxation and body awareness. Special attention is given to identifying and strengthening the positions and musculature of birth. Yoga helps you to feel more ease in the body. Pregnancy and postpartum are an especially important time in your life to keep moving, keep flowing, breathing and release anything that blocks your path to optimum health and healing. Get your glow on, mamas! Spend quality time with your little one, singing, stretching, breathing together and connecting. This is a fun high-energy session of breathing, humming, stretching and laughing that also includes mellow, deeply restful moments. In a life that’s undergoing such incredible changes it helps to take the time to center and experience the serenity of the present moment. In our class we welcome all babies and caretakers, along with diaper changes, nursing, bottle feeding, babywearing, and anything else that comes up. Babies are natural yogis, so grab your munchkin and come to class!